Since I’m about to wrap up the 7 Deadly Domerins series, it’s time to start a new one. I’m really enjoying these little serials, actually. It’s giving me a chance to explore the grey space between short and long fiction. A lot of these ideas might eventually make their way into novels but, for now, they make great practice. No matter how old she got, Ylyea would always remember the glitter of firelight in her father’s eyes when he told stories of his travels. The words were strange – only Amestane had a direct translation in their language. It meant cloud breaker, similar to the lightening that often clawed across the sky during the high summer storms. And though her father claimed it lay on the very outskirts of their homeland, Ylyea had never seen it. You could ride twenty days in any direction from Ulmelcha – the homestead – and see nary a hint of hills against the far horizon. Had anyone else spoke the legends of these great titans, Ylyea would have dismissed them, stolid and pragmatic child that she was. But her father had traveled far outside the grassy seas. He had even seen an ocean. If he said there were mountains, then mountains must be real. In her youth, while her father spoke his stories, Ylyea had imagined each of these great peaks as a singular entity, jutting from the flat spaces surrounding them in the same way anthills protruded from the rare dirt patch outside the village. Her father’s attempts to correct this vision had resulted in a series of foothills placed at the base of each titan, like worshipers bowing at the altar in the grand city. It was only recently, she had come to realize that when her father said these were mountains, he did not mean individual entities. Each spanned a vast range, ascending at various heights as they sprawled across the land like the vertebrae of a long decayed gazelle left to bleach in the sun. And she would not have accepted this simple truth if the traders had not brought maps depicting great triangles carving blockades across well-traveled roads. The homestead children stared at her with wide, shimmering eyes, their jaws half-open with disbelief by the time she finished speaking. She concealed a grin, knowing she had looked much the same the first time she heard the story and it gave her hope she had somehow managed to capture her father’s hypnotic cadence while the words flowed from her lips. His voice returned to her as she stood and yielded the story-teller’s seat just beyond the boundary of the flames. The air felt cool now, though it still held its summer humidity, washing over her face as it carried her back to an earlier time. “How long would I have to stay away?” she had protested, nearly in tears at the idea of leaving her beloved plains. What would she do if she couldn’t walk among the gently swaying grasses every morning? If she could no longer inhale the earthen scent after rain or see the birds sweeping from the sky in the distance? “But why should I ever want to go somewhere I cannot ride my horse?” Ylyea had protested, horrified at the very idea. A person could walk the plains, sure enough, but it would take them an age to get anywhere without the swift, long strides of a horse to carry them. And when she saw the winding switchback of the trade roads while they navigated mountain territory, she felt justified in her protests. Summer Caravan was one of the busiest and most stressful times for those who lived in the homestead. The grand city, at the very center of the plains, had swelled with traders come from all across the lands to sell their wares and buy exotic items to sell elsewhere in their journeys. Which meant all their most expensive wares would need to be in the city within the next week if their craftsmen wanted to get the best possible price for their handiwork. It was also time to drive the herds so that all the plains beasts could take advantage of the fresh, open air and plentiful grass. The spring herders had returned from their circuit not a week before to a round of tearful greetings and celebrations. And now it was time for the summer herders to make their departure, riding in the opposite direction of the trade caravans. So it was absolutely imperative that each group receive the proper provisions since both left on the same day. If the herders should accidentally take the trade goods with them, an unhappy craftsman would be short the money he needed to survive the winter. And should the caravan take the wrong provisions, some unhappy herder would be hunting for her supper long before she was scheduled to need such supplements. There were three homesteads such as this, arrayed in a roughly half-crescent around the grand city, each tasked with raising and keeping the animals required by the core plains population’s survival. This also meant that each homestead had a complex pattern of grazing lands assigned to them, and there would be trouble if they inadvertently crossed into the fields of their kin. On top of all that, while Summer represented the height of luxury and plenty, it was also the time to start preparing for the grueling months of winter. Repairs needed to be completed and tested before the cold, rainy months set in. New buildings needed to be erected to house the growing populations of both humans and animals. And that meant supplies would be needed from the city, supplies most easily acquired in bulk during the plentiful trade period of Summer Caravan. Somehow – and Ylyea still wasn’t sure how – much of the organization for Summer Caravan had fallen into her lap. Perhaps it had something to do with her aptitude for numbers. She could hold them in her head without needing one of the devices others used, and she had a short-hand form of tracking that saved sheaves of precious paper. Whatever the case, she had been in charge of preparations for the last three years, and no one even hesitated to speak her name when the topic came up in council. It meant that she had been running herself ragged for the past two weeks. Her brief sojourn in the story circle the night before had been her first real chance to breathe in what felt like ages. She was ready to crack skulls by the time the sun rose on departure day, but she was also confident that everything would go off without a hitch. She was just about to start feeling smugly satisfied – something she usually held at bay until after the celebratory breakfast – when a pale-faced youngster approached, tapping his fingers against each other in a way that suggested nervous anxiety. Ylyea, whose shrewd eyes missed nothing, planted her hands on her hips and arched a dark eyebrow in his direction, demanding that he speak his message. Something must have gone wrong after all. But it was nothing she didn’t think she could easily fix. Probably they needed to shuffle a crate from one wagon to another. Or settle a dispute between two herders about duties while they were gone – an argument they were free to resume as soon as they were out of earshot of the homestead. But the youngster hesitated even when he found himself pinned by Ylyea’s gaze, and that was a bad sign. “What is it child?” she demanded, having no patience for delay on a day like today. “You will not be in trouble for speaking truth.” This was the mantra of the elders, to encourage children to report the wrongs they witnessed. “What do you mean they can’t leave? Has something gone wrong with the horses? Is one of the drivers missing? What nonsense have they been up to in the quiet hours this morning?” For everything had been in preparation when the moon rose the night before. If everyone had obeyed their orders, and no one had touched anything, it should be a simple matter of mounting and motivating the horses. “Blocked?” she scoffed. “Blocked how?” Had some invading army surrounded them in the dead of night? But that was impossible. The plains were flat enough, the homesteaders could see for miles in every direction. They knew their herders were returning at least three days before they reached home. No one could move an army with such stealth in lands as flat as these to take them by surprise. “You’d better come see for yourself,” a new voice declared. It was deeper and lower than the messenger’s and drew Ylyea’s head sharply upward. One of the herders was standing in the entrance of the kitchen tent, his eyes dark, his shoulders slumped. She knew something was wrong the moment she stepped outside. The sun’s light seemed thin and brittle against the horizon, as if it had only just now begun to rise. And the shadows were long and thick, as though a great wall held the oncoming morning at bay. How had she failed to notice when she emerged from her humble hut this morning? Had the lingering darkness of the pre-dawn morning shielded the oddness from her view? Or had she simply been too tired, too mired in the last lingering haze of sleep, that she had failed to notice? For the whole of her life, the plains had spread beyond the homestead, blanketing the ground with the gentle sway of lush grass from horizon to horizon, and well beyond where the eye could see. But as she traced the contours of the edge of her village now, that verdant rug stretched only half a day’s ride, at most, before it slammed into a series of sharp, rocky outcrops. Her neck strained backward as she craned her head, her eyes tracing the ridges, cliffs and bluffs as they carved an elegant line across the sky. She turned a slow, small circle and found those white-tipped peaks surrounded the village on all sides, leaving them nestled in the heart of a valley. “Mountains…” she murmured in disbelief. Could these be the legendary Amestane – the cloud breakers – come to roost on her doorstep? “But… How can this be?” She shook her head. It made no sense. According to her father, the mountains had been carved from giant rocks scattered across the land when the world was young. The gods had carved their elegant peaks and ridges so that each would have its own face, but they should have been attached to the land from which they sprung. Shouldn’t they? Ylyea tried to remember her history, tried to remember the few maps the elders had traded for and kept locked in a water-proof trunk near the council hall. But all of them were the same, even if the shapes and writing became more rudimentary on the older pages. Ylyea’s heart plummeted and she rocked backward on her feet. Her father’s words came back to her again and suddenly she cursed the fact that she had never headed them. You never know when life is going to change. 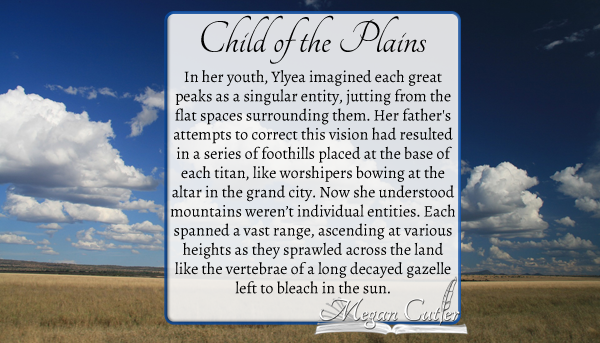 She had been a child of the plains all her life. She had eaten, slept and breathed of open skies and tall grasses, of the freedom of movement and the joy of endless sky. And one night had robbed her of it all. She felt robbed, cheated of the life she had long been promised. But she was just angry enough not to let it devastate her the way it had clearly devastated the herder. “Depending on how far those mountains go, the traders might well be trapped in the city,” she declared, certain this must be at least partially correct. “If the world has changed, we are not the only ones who will have to change with it. Rouse the elders,” she said to the child who still hovered close to her side, laying a light touch on his shoulder as she gave the command. “And send the scouts,” she added to the herder.